General Description: The Neville is a small dart point with straight to slightly convex blade edges and generally with a sharp, well-executed tip. Shoulders are markedly defined and can be square (90 degree) to obtuse. A few examples exhibit slight barbs. The stem is predominantly contracting with a truncated basal edge, some specimens may have a straight to slightly expanding stem. The basal edge can be straight to slightly concave or convex, oblique or rarely lightly notched . The Neville is overall a well-made sturdy point. Dincauze proposed it equates to a degree with the Stanly point whos range of distribution is farther to the south and west. The Neville was found with points having a Stark-like stem which are approximately the same age. The Neville type is mainly made with local finely grained igneous rocks, quartz, argillite, quartzite and chalcedonies. The size ranges from 19 mm to 64 mm in length with the average being 38 mm. 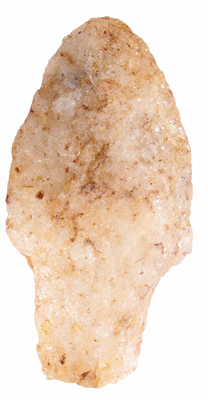 The Neville point type was named by Dena F. Dincauze in 1976 for points she found at The Neville Site (once owned by John Neville) at Amoskeg, Manchester, New Hampshire.